Mazda does it again, serving up a new model with its fun-to-drive characteristics in place. The CX-3 is the smallest of its three SUVs, a crossover that might be mistaken for a hatchback. 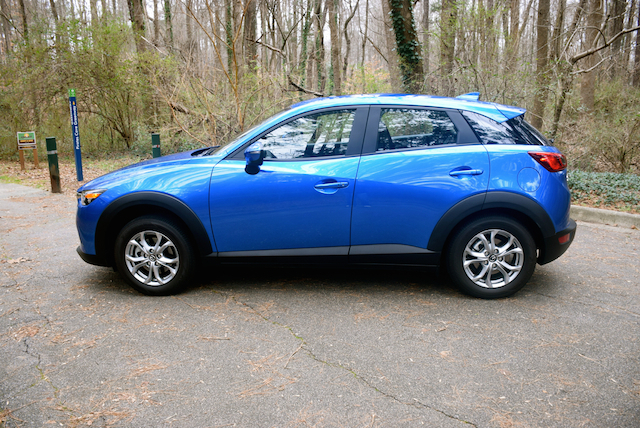 The Mazda CX-3 makes for yet another entry in the small crossover SUV segment. This emerging class, blazed by the Nissan JUKE five years earlier, now includes models from Honda, Jeep, Chevrolet, Fiat, as well as Mazda. America’s love affair with all things elevated seating continues to grow unabated and shows no signs of easing. Thank you sub-two dollar per gallon fuel! 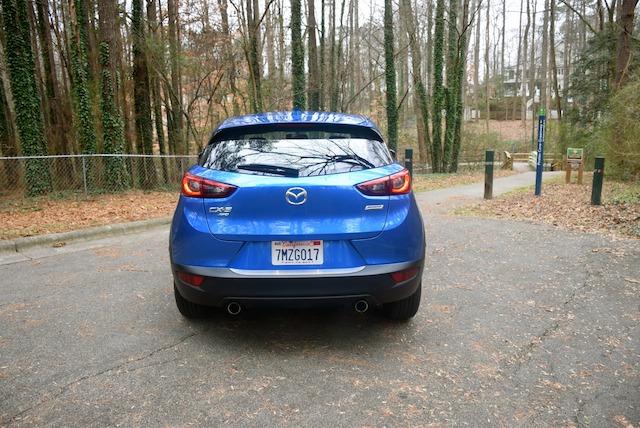 While the other SUVs in this segment sport more of an SUV appearance, the argument can be made that this Mazda CX-3 is a tall hatchback. Such is the layout of this handsome little model with its curving belt line suggesting something other than an SUV. 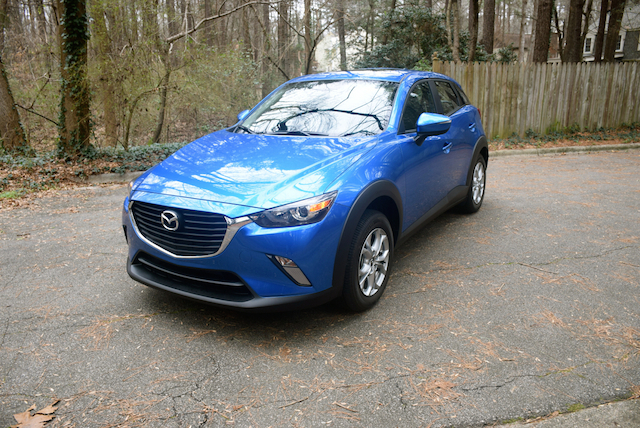 Otherwise, the Mazda CX-3 offers an entirely familiar countenance, with the brand’s now familiar gaping upper grille and sporty lower grille marking its front fascia. This model’s presentation is further amplified with its sleek headlamps and slash embrasures housing available fog lamps. Besides its curvilinear belt line, this SUV features hood indentations running from the grille to the windshield line. The side view reveals unusual dipping character lines and pronounced rocker panel molding. Additional molding surrounds the wheel wells. From the rear, an oversized liftgate spoiler is present, offering a fitting accent to the clamshell door. The blacked out rear pillars give this model a unique “floating roof” look. Sleek, wraparound rear combination lamps with LED accents are present as are reflector lights and dual exhaust ports. Inside, the cabin is surprisingly uncluttered. A tilt and telescopic steering column is present with secondary driver controls on the face of the wheel. The instrument panel is punctuated by a large speedometer in its own housing and is presented right in the middle of the layout. To the left is the tachometer, to the right is a digital display with the requisite driver information controlled by switches located on the steering column. Part of the CX-3’s clean look is achieved by placing the color display on top of the dashboard, just above the center console. Canted to the driver, the display features the expected telematics system with audio, navigation and phone connectivity possible. Its part of a “head up” cockpit design Mazda crafted in a bid to ensure that the information is easily accessible while mitigating distraction. As for the rest of the center stack, it is composed chiefly of oversized switches for the climate control system and also features the expected connectivity points — USB and auxiliary audio. At the base of the stack is the transmission shifter and a switch to activate sport mode. If you’re looking for audio controls, they’re placed between the seats just ahead of the two cup holders. Those cup holders sit beneath a folding armrest. Small as it is, the Mazda CX-3 offers average storage, including in-door storage pockets with bottle holders. The cargo area is small, measuring 12.4 cubic feet, expandable to 44.5 cubic feet with the rear seat folded. 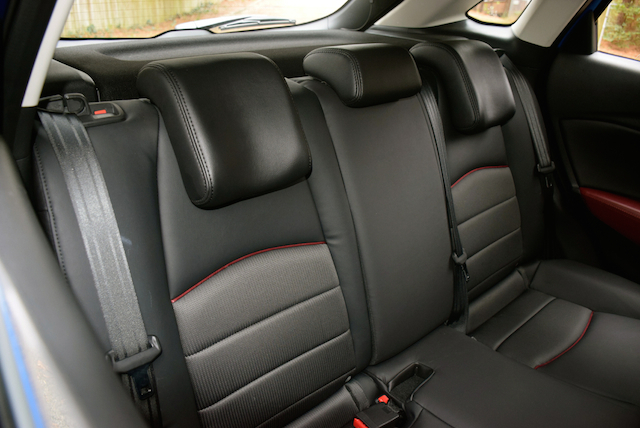 This model has supportive bucket seats up front and a 60-40 split folding, fold-flat rear seat. 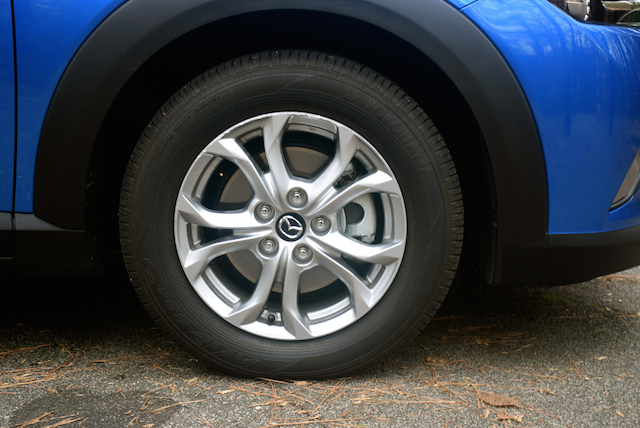 Mazda offers the five-seat CX-3 in standard front-wheel drive and available all-wheel drive configurations. Three trim levels are available — Sport, Touring and Grand Touring. The base price comes in at $19,960 for the Sport front-wheel drive model. Fully equipped, a Grand Touring AWD model should come in below $28,000. As tested, Mazda delivered a Touring AWD model, priced from $23,210 and $26,150 delivered. Mazda Mobile Start ($550) and a Premium Package ($1,410) pushed up the final price. That package includes such amenities as a power sliding moonroof with an interior sunshade and a 7-speaker Bose audio system. Standard equipment for the CX-3 includes halogen headlights, alloy wheels, power accessories, air conditioning, Bluetooth connectivity, and a rear view camera. 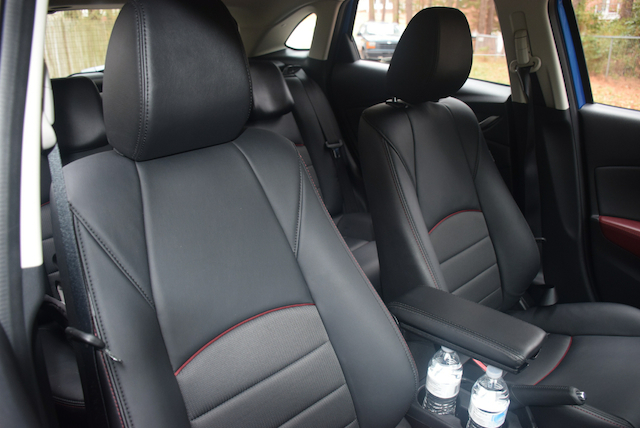 The Touring edition brings in keyless entry, heated side mirrors, heated front seats, a front armrest, imitation leather seats (cloth is standard), and a leather-wrapped steering wheel. You also get a blind spot monitoring system with rear cross traffic alert. The top-end Grand Touring edition brings in larger wheels, steering wheel paddle shifters, automatic climate control, navigation, a Bose audio system, LED headlights along with LED daytime running lights, LED rear combination lights, and LED tail lights. You also get a tonneau cover and leather-trimmed seats with this model. The smallest of all SUVs may be a bit too small for your family. Yes, you can fit five, but the rear seat is more comfortable for two. Even then, you may desire a bit more legroom — that’s where the larger Mazda CX-5 or CX-9 come in. What the CX-3 does deliver is a worthy entry-point for people who want the best combination of affordability and utility. A first time car buyer may desire this model for that reason, folding down the rear seat to gain much-needed cargo space. Unlike the similar-sized Mazda3, this model offers all-wheel drive, an attractive feature that enhances handling. 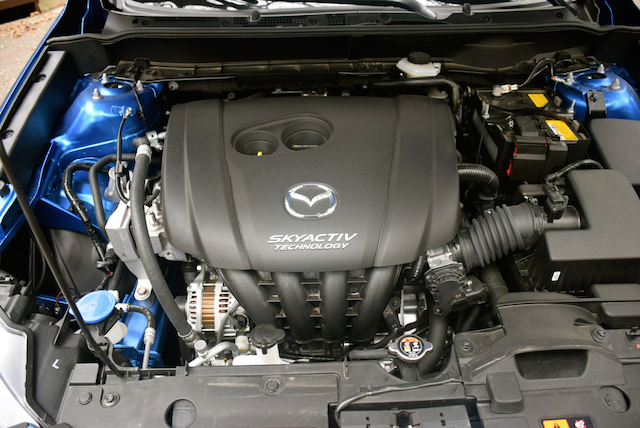 All CX-3 models are powered by a 2.0-liter, four-cylinder engine. This high compression ratio engine makes an even 146 horsepower and 146 foot-pounds of torque, adequate power for most drivers. All models come with a 6-speed automatic transmission. The CX-3’s engine is peppy, although not super powerful. Mazda geared this model toward attaining higher fuel economy, borne out with its 35 mpg rating for the front-wheel drive model. That’s quite an attainment. Although fuel prices are currently the lowest we’ve seen this century, its an advantage that will be most welcome when fuel prices rise once again. Small cars tend to wear me out eventually as my near 6-foot frame tires of the limited room. Happily, the driver’s seat is sufficiently supportive and bolstered, so no issue there. I could imagine this model serving as someone’s commuter car, providing them with the higher driving profile and superior fuel economy during the week, and serving as their utility vehicle for the weekend. And it does all this without breaking the bank. So, besides its sinuous styling, how does the CX-3 drive? Well, its handling is composed, especially noticeable when tackling twisty roads. Flick the sport mode switch and you’ll also notice a change in shift points with the transmission moving up and down each gear in rhythm. A certain amount of feistiness jumps out — shades of the Mazda3. So far, I’ve driven the Nissan JUKE, Fiat 500X, and the Honda HR-V in this segment, along with the Mazda. The JUKE is a hoot, especially the front-wheel drive model paired with a 6-speed manual transmission. A June 2013 drive up and down the serpentine hills of Appalachia demonstrated to me what that model was all about. I found the 500X the best Fiat model to date and the HR-V offering the coolest seating system in a vehicle for its size. All four models have much to offer, although the JUKE is the oldest of them all and needs to be updated — we’re expecting a new one in 2017. In all, the new Mazda shines in its segment and does so by upholding the brand’s fun-to-drive characteristics. Negotiate carefully and you should come away with a well-equipped all-wheel drive model for about $25,000, a very fair price point in this emerging segment. 2016 Mazda CX-3 photos copyright Auto Trends Magazine.